To commemorate all the cats, Resident and Re-homed, who have crossed the Rainbow Bridge. Should you wish to honour your cat, please contact us with a short obituary and photo. 13 years old and still breathtakingly beautiful. As desperate as stunning. 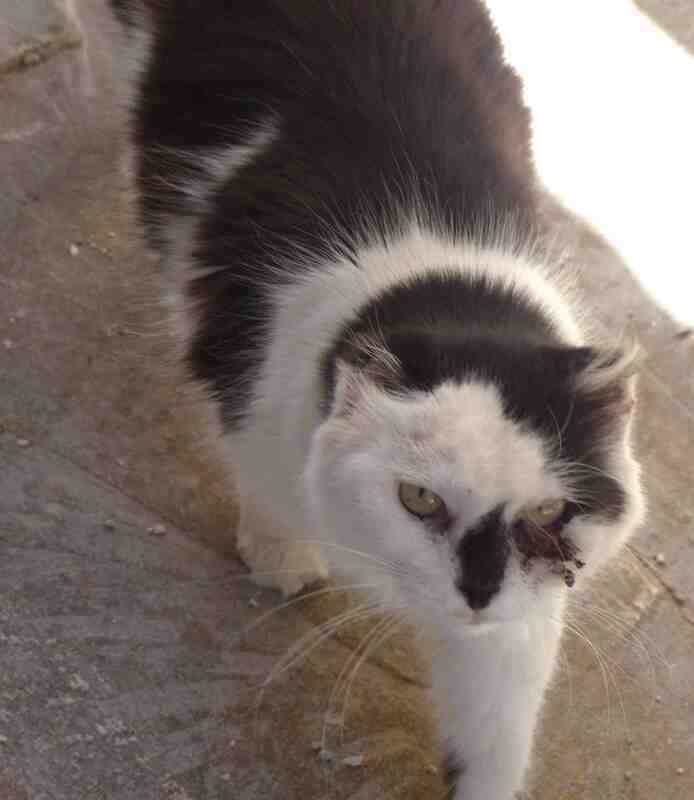 A declawed, abandoned house Cat with a very long story to tell. Pure emotion. Sabiha arrived so angry. so confused. Soul and body in upheaval. Even for a Sanctuary Cat she had experienced more than the expected share of terror and abandonment. Her mother apruptly abandoned her, squashed by a car, when they were crossing the road together. The orphaned kitten was rescued, but declawed thus made defenseless. Her reluctant owner threatened to put her into the streets, but Sabiha was rescued a second time by the estranged partner. However, when Sabiha was 13 , human commitments put an end to her stay. After a brief spell in the Sanctuary, a new home was generously offered to save her life. However, Sabiha just could not settle there. She already was very sick. She returned to the Sanctuary to prepare for her final journey. During the last weeks of her life Sabiha was reliably reassured and much loved. Shifts of carers and dedicated volunteers allowed for that much needed special attention. Serene in her weakness Sabiha abundantly returned love, co-operated with treatment and seemed to do well. Her anger had transformed in an equally strong will to please. Perhaps love and acceptance gave Sabiha the courage to move on, to a much better world. Sabiha left us so much courage coupled with pure, intense determination. ​All!!! Cats are special, but some can reach us better. Sabiha touched and broke many hearts. Yes. Stevie was both,- very precious and very wonderful! Stevie from Siggewi, a blind street Cat with cancer rapidly eating her nose away.Which means you cannot clean yourself, your sense of smell is impaired and at one point you won't be able to eat without pain. Stevie the tall and lanky Tal Madonna had a coat of burning flames and darkest charcoal. Though her eyes had no expression, her face was kind and intelligent . And in her distressuing fate she was well protected. Only a kind and caring feeder could have nurtured such a gentle, trusting, affectionate and sociable Cat! When her condition became obvious, somebody went to the trouble of trapping her. When an examination revealed that there was still quality of life, she was taken to the Sanctuary. There she calmly and obviously enjoyed routine and structure. She purred on touch, she ate like a horse, she loved her hot water bottle and when anybody said her name or even "blind Cat" she would lift her head and look in the direction of the speaker. On her regular and supervised excursions into the enclosure she worked out where food and litters were, but most of the time she just sat motionless, actively soaking up what was going on around her. She made more friends! Visitors who brushed or cleaned her, as all Cats love bring clean. Carers who came by regularly, asking whether Stevie had already been fed and medicated and if not, eagerly volunteered. Stevie radiated serenity and let her friends share. "Her" vet ensured that she went before her life deteriorated. She was welcomed in a better world where she is graceful and active again, whole and healthy, sure-footed, seeing and secure. Grazzi, Stevie, for the serenity you left us. Two blind Cats living the last months of their lives in the same sanctuary, in the same enclosure. So many parallels and so many differences in their lives and characters! If street cat Stevie was the static sun, stoically accepting her fate, sanctuary boy Charles was the moving, changing moon. It was so right that we would release her midday, but he would go at night, drawn by an immense, almost full moon. Also like Stevie Charles was immensely aware. Called by his name, he would cautiously advance, always aware that his hesitant gait surprised and possibly annoyed less intelligent Cats. Unlike Stevie, who needed strong smelling food to guide her cancerous nose, Charles had an awesome sense of smell. He smelt food and medication with almost uncanny precision. He and Stevie both loved food and before he went on his last journey, Charles decided on a full evening meal. Again and again Charles proved his strength, disappearing himself out of his various cages. Unlike Stevie, who blissfully snuggled down in her basket, Charles would lie in wait. The moment the carers left, he would wriggle and force and ESCAPE to freedom and movement. 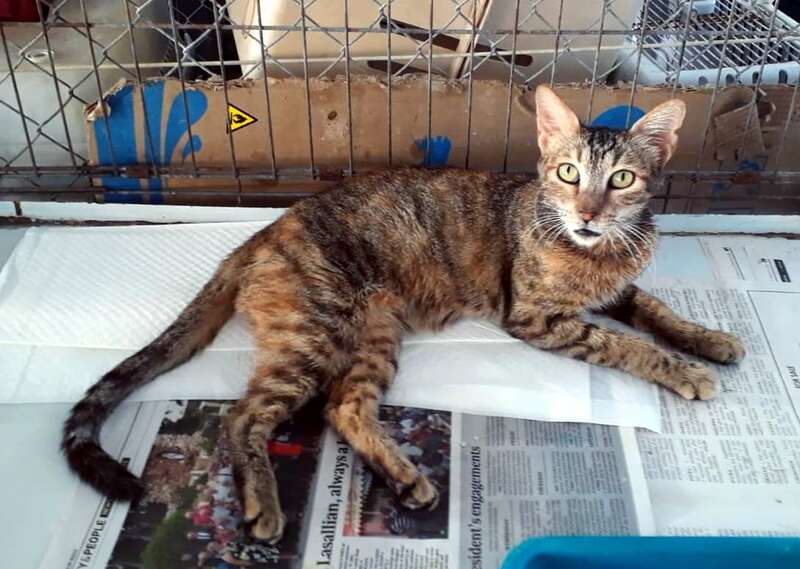 Then the patient metamorphosed into the former Sanctuary Cat again, using communal litters, eating from food trays, finding a safe corner from where to take in the goings on. A trail of diarrhea marked his movements. Cleaner and carers raged, but loved. Charles knew he had supervised enclosure time in the afternoons and waited at the cage door for this privilege. Unlike Stevie he needed to move and pretend he was a normal blind enclosure Cat. From this he drew the strength to fight his illness with determined patience. Charles did not give up, he co operated with examinations, X-ray, ultra sound, no end of diets and treatments. Until the end Charles remained a model patient. Then Stevie left and the moon waxed. And Charlie said good bye and that he would move on. ​Was there a connection? How much were these two blind Cats aware of each other? They never sat together, never sought each other's company. They were both much loved and respected Very Important Cats. The Sanctuary received inquiries and condolences for both from visitors abroad on whom they made a lasting impression. Stevie from a lady from Wehringen, Charles from a gentleman from Oberding-Schwaig. Both blind Cats initiated fruitful discussions, inspired friendships and forged links. 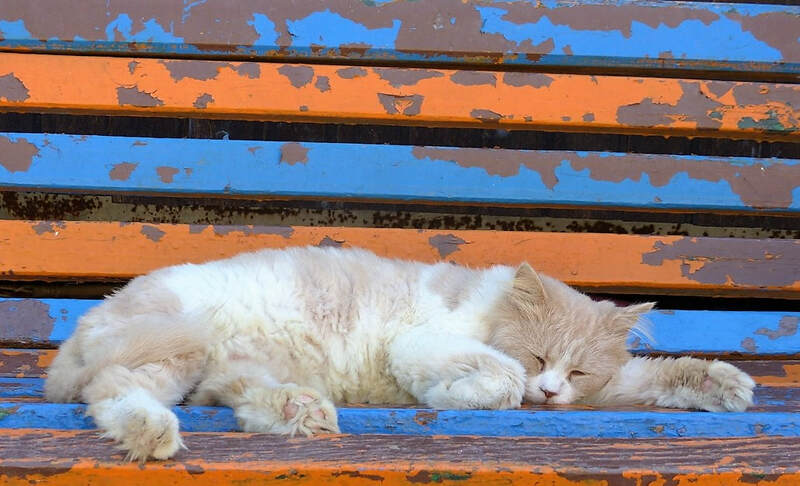 ​A full Cat's life? We hope (!!!) Charles would agree. The golden tom arrived a stranger and left us named. We will never know when and where life went wrong for Badano. Did he ever have a home? He was spotted on a very wet, cold and grey January afternoon. Not neutered and new to the area he had made it into the sports ground opposite the Sanctuary. Very weak, dehydrated, shaken by a violent, viscous flu, bleeding from an infected bite on his neck and with an injured foot, the tom was shelterig under bare twigs. Would you have noticed him in the failing twilight? Or would we avert our eyes? Would you have stopped your car? Would you have risked your health and your clothes, trying to catch a sick, cowering cat on the slippery wet stones in the undergrowth? Badano's Samaritans did exactly that. They pleaded for his admission to the Sanctuary. They left money and their address should more funds be necessary. The Good Samaritan had done the same. Emily Dickinson would have rejoiced. But Badano was on a journey and the Sanctuary was only a stop. Here he was cleaned, cared for, sheltered. Pain relief, drip and a good rest. Gathering strength for the final leg. The vet, who sedated him for examination, diagnosed hard and failing kidneys and decided not to call Badano back. The golden tom has arrived in the next world. Painfree, loved and named. Attacked and badly injured in unknown territory. 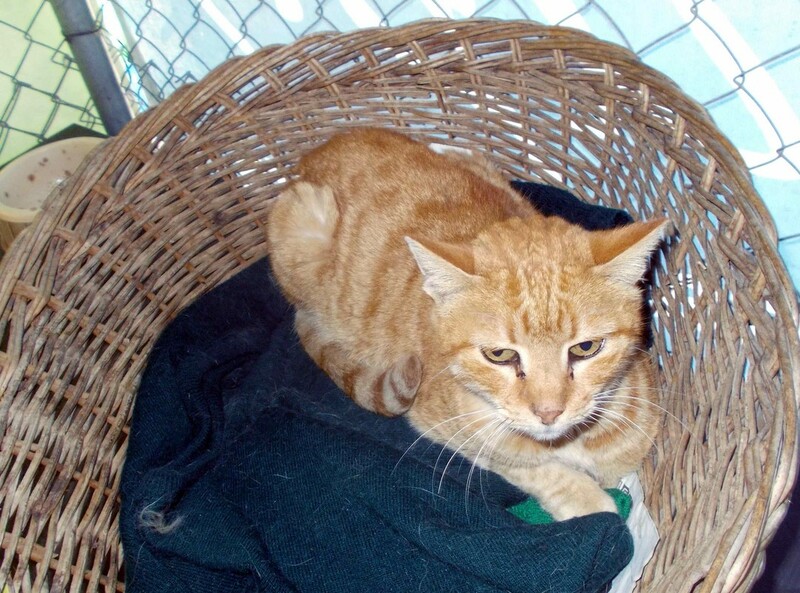 If neutering had been granted, he might have never left his home. Dragon or dinosaur? Surely Buxlu was not born, but hatched. Older than Malta's carob trees. Wiser than any Cat. Filled with love more profound than the sea. When he first appeared attempting to feed with a colony of Cats, they and their feeder were stunned. A spectre of a skeleton, a scaly reptile on tiny feet, craning its neck, its yellow eyes gleaming. The feeder found compassion which transformed into love. Time and food were set aside for the strange creature. Mutual trust formed strong visible bonds and Buxlu grew back into a muscular, clean, if slightly shaggy Tom Cat. When he became too ancient to survive in the rough and hostile colony environment, his feeder bought him into the Sanctuary. Here the strong and gentle giant lived as a quiet, grateful member of the community, receiving respect for his age and position, purring liberally and sonorously, sharing his bed with many a weak or younger Cat, enjoying the sunshine, always ready and present when his feeder arrived. This year Buxlu's decline was fast and his departure unexpected. Having behaved impeccably during vet visits and given a clean bill of health, he moved on in the early hours of a Sunday morning .Towards the Sun! Towards the Light. To fuse with the Love he was made of. Genaro was owned and loved. His new home was waiting for him. But he couldn’t quite make it. His time came to cross the rainbow bridge before he could come home. He knew his other family who were waiting for him and he crossed peacefully to be with them. He said "Dad its just a bit too hard, too late in my struggle, but at least you found me at long last". I said “I am sorry it took so long to find you. " Genaro replied, "Its ok Dad, you did find me and now, you can make sure things are better for the other’s whose journeys are still here in the sanctuary.” I promised him I would, and so we parted. 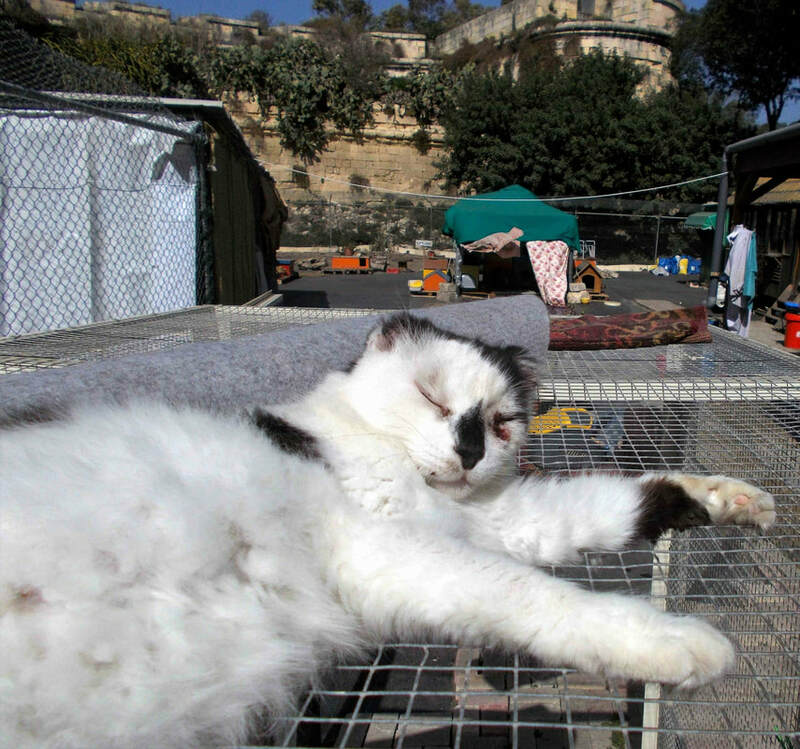 The Genaro Wing is a special place where blind and disabled cats get their own private space and are treated with that extra care so when they find their owners they can make it to their new homes. 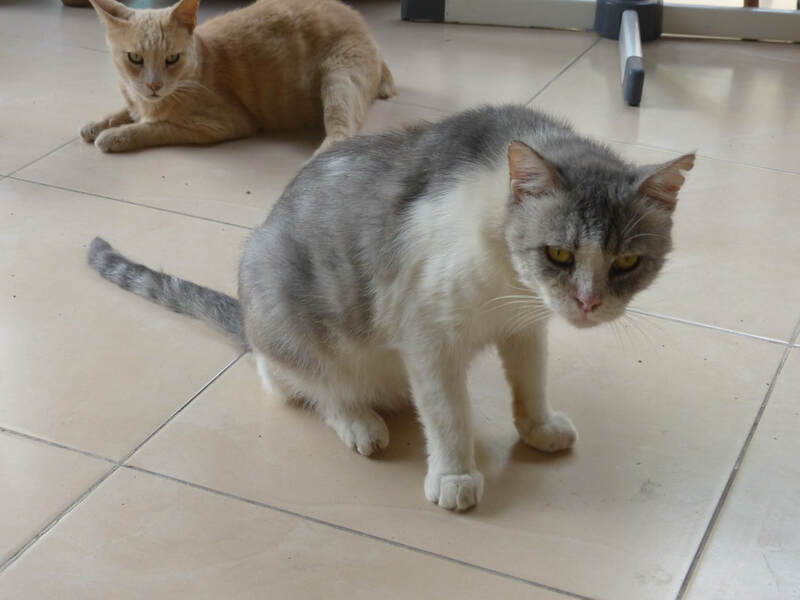 Please consider these cats for adoption as they can also be very loving like Genaro was. Goldilocks was a contradiction in terms. He was as brave as he was frightened, as proud as he was grateful, as needy as he was independent, as fragile as he was strong. Goldilocks loved cages and craved freedom. He did not want to commit, but loyally kept all appointments. He was not terribly bright, but communicated so clearly!!!! And like all Cats he understood every word, even if he did not always act on it. How will I remember him? Proudly, proudly enjoying the luxury of "his " cage or cunningly choosing the moment to hop out and away when his free spirit took over? The many times he expectantly entered "his" cage which in the mean time had been given to a more needy cat and his surprised disbelieve to be barred from entry??? Stealing into the enclosure on a wet or windy night, snuggling down in a basket and visibly enjoying my delight when I found him there? Melting into my hand in order to be brushed and brushed and brushed? The proud pleasure when he was groomed and cleaned and felt like a proper tom? As far as I know Goldilocks never had a fight. He loved rubbing against other Cats, preferably his size , but also much bigger ones. They all respected his peace offerings and tolerated his chronic nervousness. Goldilocks loved his Sanctuary. For him it was a terribly exciting place, his home and his wonderland. Did he know he would have had NO chance of survival as a stray? What did he make of his journey? I imagine him sprinting towards the almost full moon growing into the mighty, majestic tomcat he never could be on this earth, shedding all fear and pain. And then calmly (!!!) looking down, in the Company of all the friends who made the journey before him, onto his Sanctuary below. Enjoy exploring the next world, my darling. A handful of fluff and infinite love. Oeans of patience. Keenest attention and boundless gratitude. Nannett had such will power, she communicted so clearly. She went as she lived, like the gentlest of breezes. She touched many hearts. Nannett does not want us to mourn for her, but to share out the love she so abundantly gave. We celebrate the life of SUGAR who left us in the midday light of Wednesday, 27 June 2018. We are deeply grateful for his life. For 13 years Sugar was the Cat behind Csaf President Doris, who founded our Sanctuary. Sugar embodied mercy. Thrown from a window as a small kitten he was rescued by Doris. Sugar never again was the carefree, playful kitten, never an exploring adolescent, never a secure and fast moving tom. then admiration and always thought. 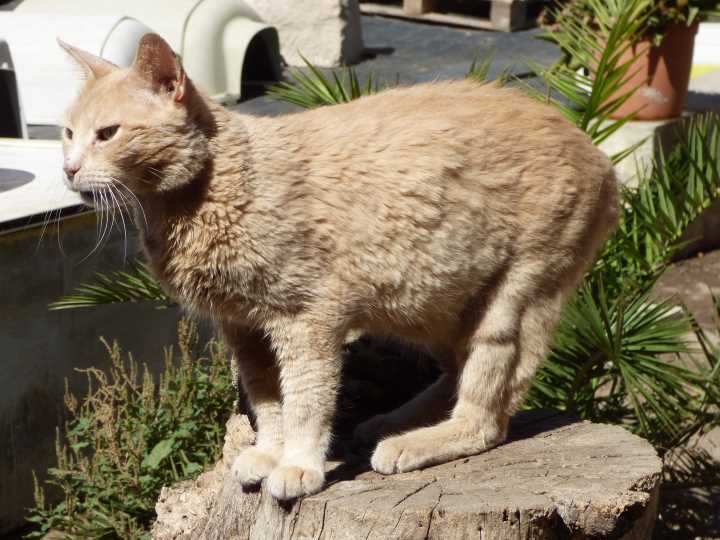 Sugar gave his life to and never grew tired of representing us Cats to people . 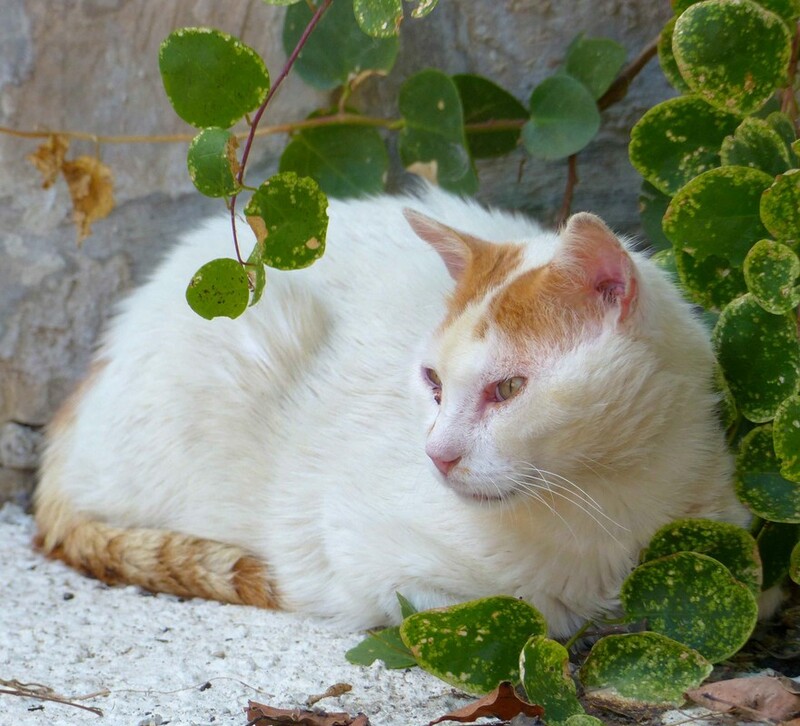 By his existence he demonstrated that handicapped Cats can live a full life, provided they are allowed to exchange love and receive reliable care. Sugar loved and he was loved by MANY. He was a very clear communicator, despite his handicap. Like a fish he flung his body forward when he fancied a change of place or when meals were late. Feeding him was a privilege and quality time for our carers. One of his human friends regularly brought a selection of best cat food just for HIM. Sugar retired from the Sanctuary two years ago when Doris took him into her home. He still visited us regularly and represented us Cats to important visitors. Sugar started his last journey from the familiar hospital container which had been his base for years. We, the Cats, saw him off in respectful silence. Doris and the vet made sure it all went well. His body, rigid for 13 years, has relaxed. Sugar's spirit, the spirit of mercy, will remain with us. ​We hold Sugar to the light. He is young again and forever healthy, moving effortlessly and with grace. 300 Sanctuary Friends, Stray or Abandoned. 19 June 2018. Sweetness and strength..Her memory remains. A graceful, gentle Tal Madonna. So serene, so affectionate, so very delicate.. In her slender, dwindling body lived a soul so strong, a personality so great that you felt rather than saw her presence. With her ready purr Maigrina lived joyfully and happily despite many ailmements. Loved and supported by feeder and carers she gave back in double measure. Nobody looking after Maigrina ever complained. Her affectionate, intelligent company, her reliable co operation and obvious gratitude were ample reward. When she prepared for her journey she did not seem sad. She was leaving for eternal health and a painfree, strong body to match her soul. Grateful for a last gentle cleansing she was ready to let go. One of her small friends in the leukemia enclosure lay down close to her, together they could see the night sky. Maigrina took messages for all the friends waiting for her. James descended in a straight line from the Knights' Cats. He was an aristocrat from top to tail, a tom without fear or blame. James had a great, big heart and very high standards. : he was always gentle, always impeccable and extremely dignified. Whether he encountered other Cats or vets, James reliably kept his composure, showed courtesy and NEVER panicked. James was a big, beautiful and immensely lovable tom who impressed whoever he met. Diagnosed with cancer in his head he stoically and reliably took his medication and lived. When he got slightly senile in his old age he sometimes needed help to find his way back into the enclosure after his routine evening stroll. But somehow he manged always to be "home" after dark, attentively watching the goings-on in the Sanctuary with his amber eyes through the enclosure door. His last illness was short and violent. As usual he accepted all the support on offer, but he realized before us that this fight he would not win. He left alone, drawn by a full moon..
No doubt James is still watching all of us from above, - strong, beautiful and with much love. ​May we always live up to his standards!!! So much loved, so much missed! Left us 15 February 2018, 12:45 p.m.
Scottie was a very special strawberry coloured cat. Sensitive, brave, dominant, loving...With his stumped tail and sticking out hind leg he reminded us of a little dog. Scottie came running when called, he followed you around, always hopeful for attention. Scottie was upbeat, positive and alert. He could be very funny and equally mischievous..
Scottie was a lovable leprechaune, a merry wanderer, a quirky creature with most eloquent eyes and enormous courage . And he needed his courage to survive in the streets and still give so much to his feeders and carers. For years he suffered all weathers in a car park. he had the most unfortunate tail amputation, a torn ligament in his leg, gingevitis .....His FIV would have demanded extra care and comfort . But the in so many ways disadvantaged and hadicapped tom hardly ever felt sorry for himself. All his life he realized that he was special and all his life he defended his position as number one. He tried to get his own way whenever possible and usually succeeded. He was so very grateful for special care and small comforts like a clean up, a cage to himself to rest in, a hot water bottle. Scottie was a mind reader and communicater. When illness fially, finally defeated his body, he was not alone. He left us much loved. Wherever he is, he has a lovely long tail now, gracefully moving legs and he won't suffer ANY pain. And he left us a legacy: his unfailing courage, expectant hope and generous, indiscriminating love. ​ Was there ever a Cat so clever? Malcolm left us unexpectedly and he doubtless found his way, straight into the next and better world. 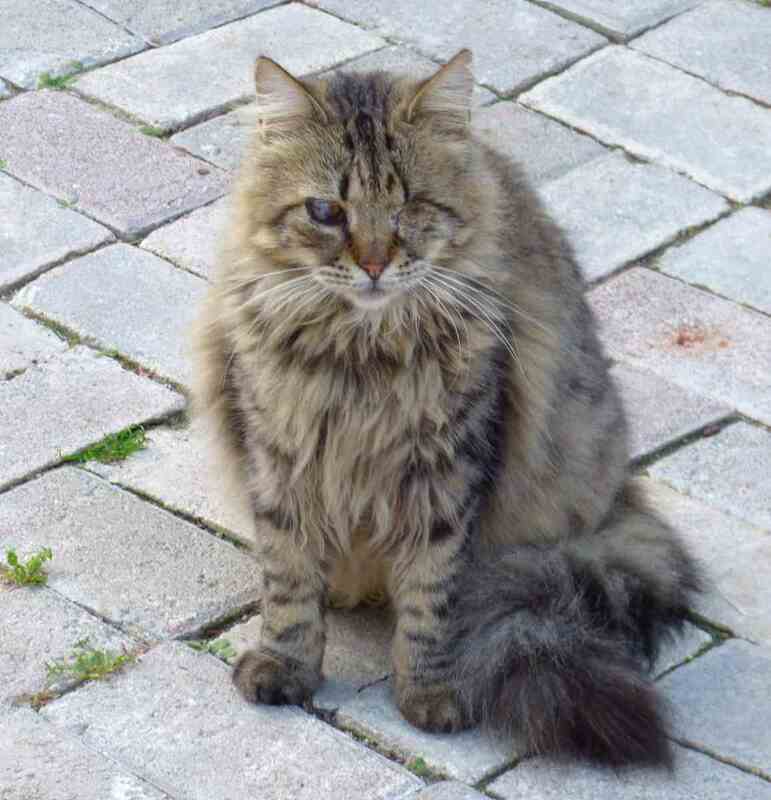 He was the most intelligent cat I ever met and - despite his blindness - a match for anyone, human or cat. A slight, beautifully patterned ginger, Malcolm was Mr Mephistopheles reborn. Admittedly fate had not been kind. Homeless and with only one blind eye, many might have found survival a challenge too daunting to tackle. Not Malcolm. ​While keeping a low profile, he was a cat who managed to look at the bright side of life. After all, he was rescued, bought into the Sanctuary and throughout Malcolm's life his saviour remained his reliable and generous sponsor. Even though his visits from Gozo were scarce, phone calls enquiring after Malcolm's well being were regular and they made Malcolm feel that he was special to at least one person. From this as well as from his baffling intelligence he drew a distinctive aloofness, a quiet, almost challenging confidence. Though strictly reserved with humans and most cats, Malcolm dropped all pretences when it came to high quality food. Malcolm was a Gourmet who knew exactly when, where and to whom special food was served, be it with or without medication. The trouble he took to steal had to be seen to be believed: no cupboard or shelf was too high, no feeding cage to tight for his extra ordinary nose and stealthy paw. Even if you watched him like a hawk, he still found and made full use of "his moment". Like spider-cat he would patiently and determinedly weave his way up and around all imaginable obstacles, defy gravity and lack of sight until he could partake of the meal without the feeding cat even noticing. Malcolm most certainly could creep through the tiniest crack and walk on the narrowest rail." Was he lonely? Yes, probably as regards relationships with humans. 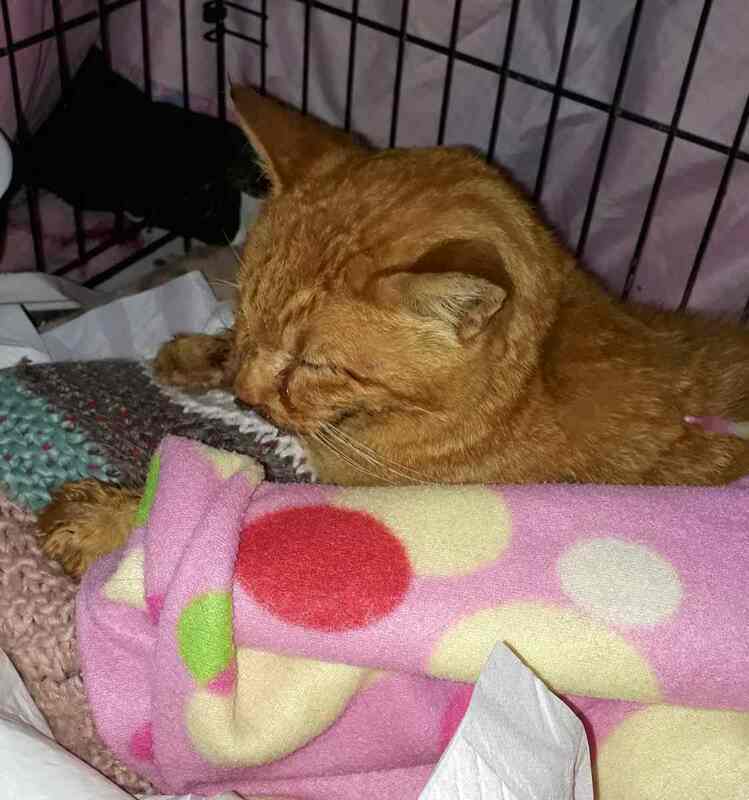 Only right at the end, after his kidneys failed and he was very weak, did he allow us to handle him, showing no nervousness and visibly responding to kindness. Malcolm's feline friends with whom he used to snuggle up at night were cats who were either also blind or had impaired vision. They obviously felt safe in each others’ company. Though his thieving feats would drive carers to exasperation, he also made us laugh and wonder. He left us loved and respected. He is greatly missed. Malcolm can see his food now! Enjoy! 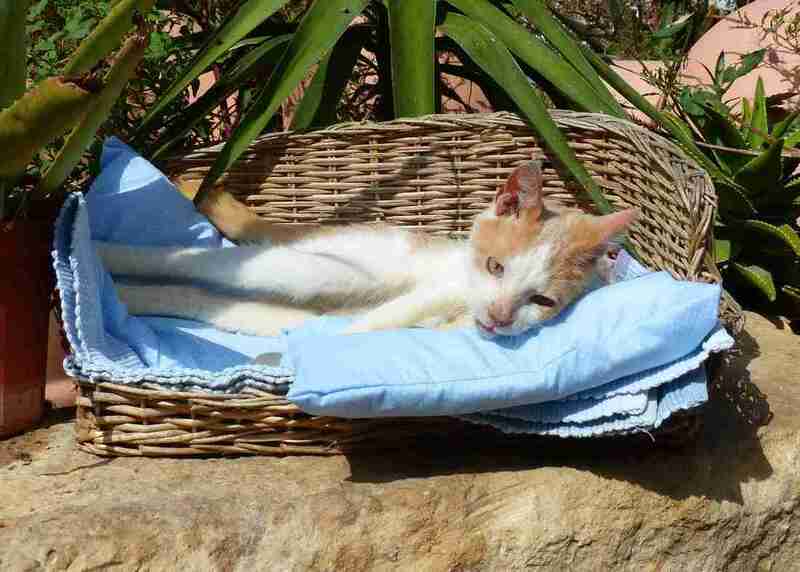 Rudi died quickly and with little suffering after his liver failed. He was a along time resident of the Sanctuary and is sorely missed by all who knew him. He was the King of the Castle! 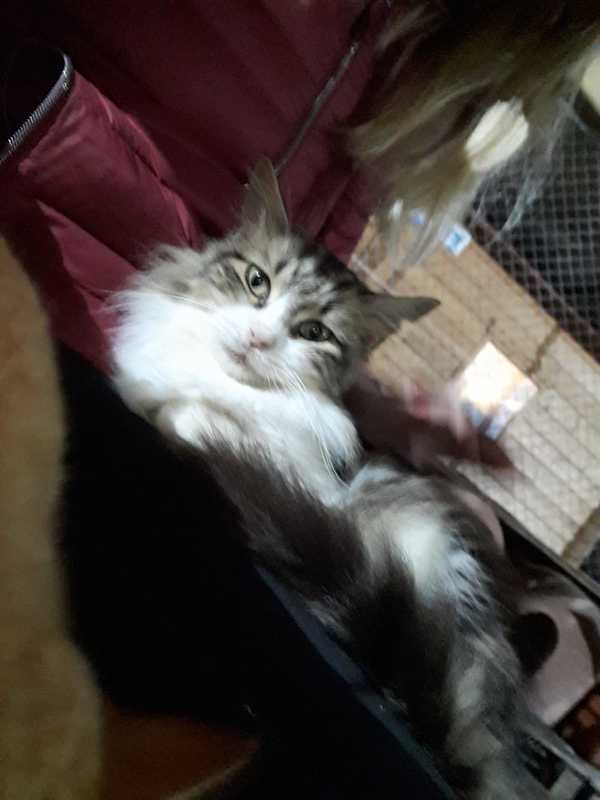 With his handsome Persian looks, his silky brown and white coat, his fluid movements, his expressive, enigmatic amber eyes, - it was above all his gentle, loving and very special personality which attached him to carers and visitors alike. Rudi definitely did what he wanted to do, but he never hurt anybody. In a way he seemed to know that he owed his life to the sanctuary. Rudi radiated a very dignified, strong and loyal affection which was reciprocated by whomever he met. Rudi made it obvious that he enjoyed his life. He relaxed deeply, slept soundly, moved effortlessly wherever he chose, took a dignified, intelligent interest in life and was universally liked. Chikku of Bormla: noblesse oblige - a life lived to the full and with Valour! Chikku is on his way. It was his decision, taken - as always - independently and with so much love. He went quickly and to the last appreciating the care he got and the comfort provided. The large corner cage in a quiet small room with a window and a very nice, unobtrusive gentleman as a neighbour. The clean bedding, the hot water bottle. plenty of drink, the large drip to hydrate and detoxify. Love, concern, care, Chikku was purring when we said good- bye. See you tomorrow., I had said, He was resting, gathering strength for the journey. He had been a big strong cat with a clear independent mind, courage and as much will power as perseverance. When he decided to live he gave everything. He conquered fear and pain. He way-layed me for weeks until I noticed he was suffering, He freely co-operated with rickety transport, unknown destinations, makeshift accommodation, new environments, vets, complex operations, a vast array of pills and treatment: Chikku wanted to live and he lived. I was trying to gauge his quality of life, but 2 days ago Chikku took the decision . Monday was the first day ever when he was not waiting for me near the Sanctuary entrance. The next morning he was not - as always - in his basket, but the search party found him outside on the cold tiles under the sink. He resigned himself to the cage and a really good rest, enough to say that this time, he did not want any blood taken. Thankfully the vet let him win his last fight, mercifully allowing him to stay in control until the end. I once said, if Chikku had been a man, I would have married him. He was so immensely loyal and affectionate. At whatever hour I left, if I said good-bye to him, he would drag himself out of his basket to see me to the door. Then he would stay there looking at me until I was gone. The next day he would be sitting in the same place, waiting, - his internal clock told him when to expect me. Of course I know he led a rich, full life without me. He had many friends whom he really loved . He had his very special relationships and great admiration for certain humans. They were allowed to inject where I feared to touch. Chikku was fascinated by cars and loved his drivers. A big, big Grazzi to all the many kind people who drove us to our vet appointments! Chikku communicated with me like no other cat ever had. He read my thoughts and he replied. There was so much love and strength in him! Though he was clever, Chikku was never cunning. There was no way round obstacles for him. He was as straight forward as a bull. He even lowered his head before charging. He is on his journey now, determined and getting stronger and younger with every pace. When he gets there, Chikku will feast, he so much loves his food! He then will clean himself from head to tail, perfectly. And then he will lie on his back, sprawling, all four legs in the air, in eternal bliss. GRAZZI to all who cared, loved and supported! They were so many!!!! She is free now. She said very clearly today that she was ready for the journey and tonight the kind, competent vet and I saw her off. Outside, in front of the container, surrounded by sleeping or very quietly moving cats and the full moon breaking through the moving clouds. 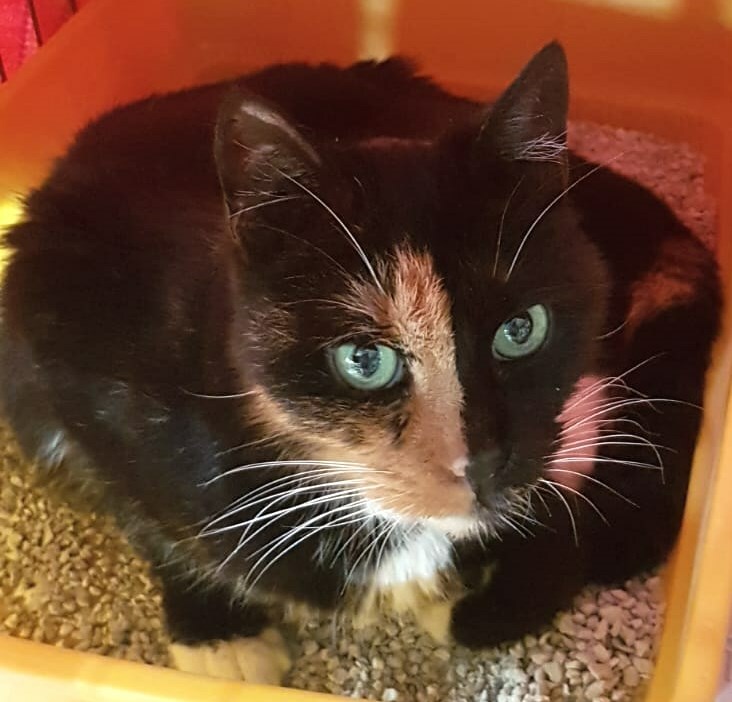 All afternoon she had hardly moved from her basket in the warm container, but in the evening she went out, almost as if expecting the vet who I had promised would come to set her free. When she got cold and very slightly restless 20 mins before the vet was due we snuggled her in a blanket in a cage. On a very low table and almost completely covered in a cosy blanket she remained completely calm and let me massage her through the bars. She remained calm and settled throughout. She went on her journey prepared, first class, calm, majestic and with her own dignity. She left a BIG GRAZZI to you: for ALL your love, care and loyalty. She also left a lot of HER POSITIVE ENERGY in "her" sanctuary. The Danish skippers who so generously cared for the Black Pearl cats during one hot summer had christened him "Eyeliner".For me he was always Barnaby or the The Red Prince. He responded happily to all his names. During the summer 2015 he developed a tumor encasing his ribs. In December my vet very kindly came to the Black Pearl to observe him and recommended examination. He allowed me to catch him without any trouble and behaved well at the vet. Almost all his remaining teeth were removed. They were infected and cleaning himself had become too painful. What remained were two teeth and a big appetite. 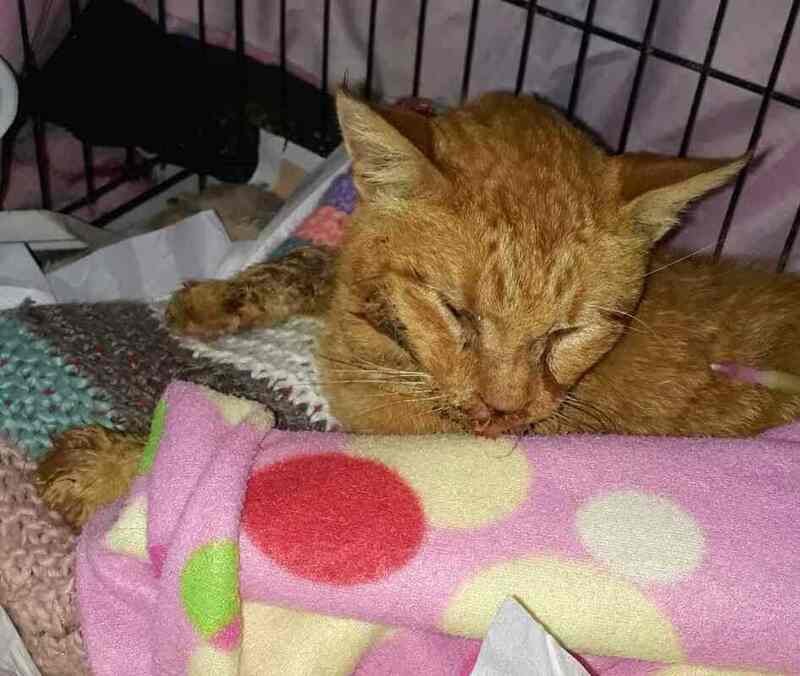 However, Barnaby was not only FIV positive, but his cancer was inoperable. I was immensely grateful to the CSAF Sanctuary offering him a place. When my Red Prince returned from his dental operation, still on medication for a week, he got a big cage all to himself with a cosy basket and a big clean litter tray in the warmest container. Unused to such luxuries Barnaby lay down in the novel litter tray and purred. Later we moved him to the hospice enclosure with the blind or nervous or very old cats. 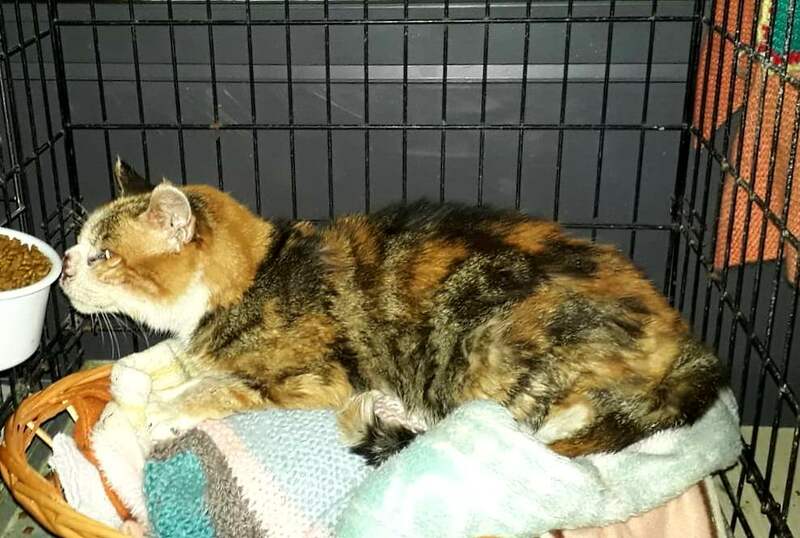 Two other cats with cancer were also receiving care there. Cats in this enclosure are quiet and gentle and we try to keep the enclosure as cosy, clean and friendly as possible. Barnaby settled bravely and well, resting in favourite places which changed with the season. First it was a cosy basket high up on the cupboard, then a sheltered hole "with a view" in the top of a scratchpost, then a cushioned shelf on another scratchpost from where he could view the cats outside. Sometimes it was a big soft cushion on which he rested in a very relaxed, grateful and touching manner. I visited him every day and he always came down to greet me, looking at me intently from his expressive, almost burning eyes. My visits triggered Black Pearl memories in him: the moment he saw me he rushed to the food dishes always available on the floor and began to eat ferociously. I had to rush to get out the special food for him otherwise he would be full of "ordinary" food before the special was served. On his dying day he was still so vigorous, he even chased a big, strong white tom literally five times his size from the food dish they both had chosen simultaneously. The Red Prince was very loyal, amazingly upbeat, very appreciative and above all very brave. Born in the rocks above the sea of a shy feral mother he had built up love and confidence throughout his life. Over the last three months I was allowed to touch him, to brush him with a toothbrush and he purred when I stroked him. He even let me clean his eyes. With this moon waxing he became increasingly interested in sitting next to the door on a mat and looking out. Last night he probably slipped out of the enclosure when visitors were not paying attention and this morning he was a "real" sanctuary outdoor cat. Eyeliner was so proud when I came and he greeted me outside! He followed me into the enclosure though, like in the old Black Pearl days, with his tail up. I was reminded of other cats passing away after they had seen the full moon, of cats getting out of doors to find a place in the open to die and realized that Barnaby was on his way too. I told him that the funny Ta-Xbiex big grey and white tramp Dusty, his father the Big Red Tom, Tess, Despina and of course kind, gentle Honey were all waiting and looking out for him. I could hold him and the vet who had visited Barnaby at the Black Pearl and cared for him in the Sanctuary was kind, gentle and very good. She gave Barnaby just anesthesia and when he was fast asleep an anesthetic overdose. I did not notice when he went! I talked to him while all the other cats sat very quietly around us. James, one of his big grey and white friends next to us, all the others relaxed, sleeping or resting. Even the cats outside came close, creating a good, very quiet and comforting atmosphere, very, very much like what one of his many feeders calls "Best time" after feeding at the Black Pearl. Barnaby by now has completed his journey. Clever, courageous and trusting. He is the Red Prince again, in all his strength and burning beauty.